Jinro soju is most popular hard liqueur in South Korea. Three South Korean companies are tipped to wage a heated battle to buy Jinro Ltd. , the country's largest maker of distilled liquor "soju" on the block, industry sources said Wednesday. The bidding deadline for Jinro is 3 p.m. Wednesday, while the company intends to pick a preferred bidder in early April and seal a final contract by July. Up to 10 prospective buyers are expected to offer bids, but favorites are Lotte Chilsung Beverage Co., Doosan Corp. and CJ Corp., according to the sources. As of Tuesday, 12 domestic and foreign companies had conducted due diligence in the run-up to the auction. "It is still too early to predict who will be the successful bidder, though the three firms are considered strong candidates," a market watcher said. In last-ditch efforts to gain the upper hand, prospective bidders are in brisk behind-the-scenes talks to find suitable partners, he added. A South Korean TV actress Kim Tae-Hee appears in an ad for Jinro soju, the most consumed brand of popular hard liqueur in South Korean market. CJ Corp., South Korea's biggest food and feed maker, said Tuesday it had broken off talks with Kirin Brewery Co. of Japan on joint bidding. Another factor to affect the bidding result may be what judgment the nation's antitrust watchdog will make on the issue of market monopoly after the sale, he said. Jinro dominates the domestic soju market with a share of around 55 %. Market watchers say Jinro could be sold for anywhere between 1.5 trillion won (US$1.47 billion) and 3 trillion won. Jinro has been in court receivership since May 2003 but its business performance remains strong, posting an operating profit of 221.9 billion won on sales of 734.7 billion won last year. Soju, a distilled alcoholic beverage, is popular among drinkers in South Korea. 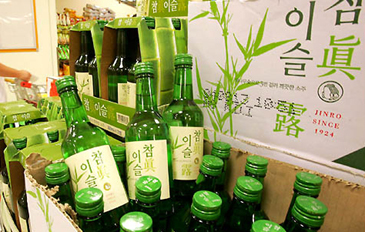 South Korean adults drinks an average of 86 bottles of soju a year, according to government statistics.